That’s from a well-argued an essay in the Wall Street Journal by John O’Sullivan. The essayist is a conservative (associated with the National Review), but his reasoning calls to mind the more classically liberal John Stuart Mill. The view that is being silenced might be true, so to silence it implies our own infallibility. But we must admit that we are not infallible, and so we ought not to silence the offending view. If we were to silence it, we might be unjust not only to the persons holding the offending view but even to ourselves and to posterity. We might, in silencing that view, be cheating ourselves and generations to come of the opportunity to exchange error for truth. The offending view will likely contain at least a kernel of truth. As philosopher Ken Wilber put it, “No one is smart enough to be wrong all the time.” [^1] the prevailing view is unlikely to be the whole truth. By preventing a clash between the offending view and the prevailing view we are denying ourselves the opportunity to come to a more complete truth. If we don’t allow the prevailing view to be regularly and vigorously contested by exposure to contradictory opinions, that prevailing view will come to be held in the manner of a prejudice. In fact, as Mill puts it, it will become just one more superstition. Views held in this latter manner become weakened and their meaning gets lost. People no longer really hold the view based on conviction and experience, but as a mere empty formula. We end up not even knowing what we believe or why we believe it. These prejudices stifle our opportunity to come to genuine convictions. In short, our chances to become authentic, free persons are at risk. For all these reasons, all views ought to be open to being contested. In fact, says Mill, if we were ever to get to a point of full unanimity on a particular view (never fear! ), we should consider appointing something like a “Devil’ Advocate” to serve as an official opponent of the unanimously held view just so people would know not only what they believe but why. Now, as Mill would be first to admit, this argument itself is arguable, and today it has an increasing number of opponents. O’Sullivan’s piece offers a list of efforts to curb freedom of speech from all sides of the political spectrum, including initiatives on the part of his own conservative camp. Nat Hentoff wrote a book entitled, Free Speech for Me but Not for Thee (1992). It’s subtitle is: “How the American Left and Right Relentlessly Censor Each Other,” and that could also serve as a summary of O’Sullivan’s essay. My mom used to tell me that “sticks and stones may break my bones but words will never hurt me.” On the other hand, the opponents of free speech tell us that “words hurt” and argue that hurtful uses of words ought to be prohibited. Who’s right? I think in fact that words can hurt very much. For instances, the messages that kids receive from parents, teachers, and clergy can stick with them through life, and many of those messages can be quite damaging. Bullies can be mean not only with their fists but with their tongues. Racist views, ethnic prejudices, and gender stereotypes congeal into unjust practices. If words are the cause of these evils, should they not be prohibited? In other words, we have to weigh the cost and benefits of prohibiting speech with the aim eliminating certain evils, and the conclusion of that analysis shows that it is (almost?) always more beneficial to protect the freedom of speech at the risk of having someone suffer hurtful words. Free discourse and the right to disagree are conducive, on the whole, to the common good and are certainly necessary for the preservation and advancement of culture. Indeed, we could apply the Pauline principle (Romans 3:8) that we ought never to do evil that good may result from it. Freedom of speech is a good, the suppression of it an evil. 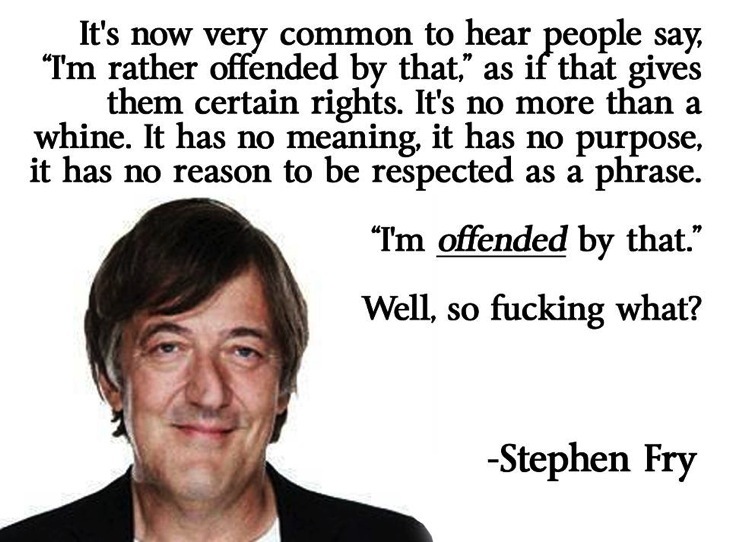 Thus I say: Offend me! 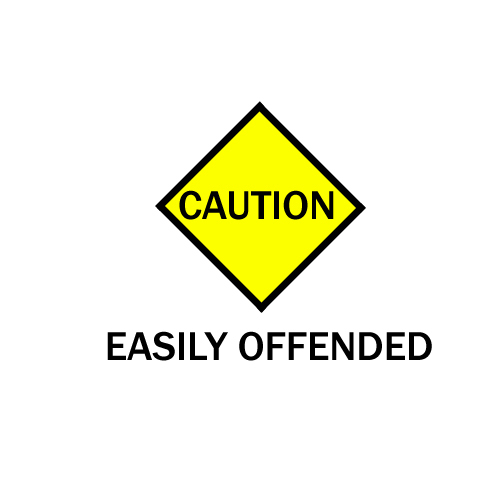 I take very seriously my right to be offended. So go ahead: take issue with my religious, philosophical, political, and aesthetic views. Show me the error of my ways! I am not going to complain you are “forcing your morality on me” (unless of course you try to get your view enacted into a law such that it may never be questioned again). What I hope you will do is argue with me, if in fact we disagree, and not just hurl epithets. We do not have to be mean spirited to have a spirited debate. But if you’re simply going to call me names, go ahead. One of us will end up looking more stupid and vulgar than the other (spoiler alert: it will be you). And while we’re arguing about freedom of speech, we can argue about the hard cases. We can argue about whether only human persons have this right to free speech or whether fake, militarily defended corporate “persons” have this right, too. We can argue whether freedom of speech means we have to accept the money influence on elections. We can argue whether non-speech expressions of ideas are also protected (burning books and flags, for instance). There is a lot to argue about. I will assume that neither of us wants to be wrong. If so, then resist will all your might the temptation to silence your opponents. Free speech for me AND for thee!! I read that thing on not voting. It raised issues for you? Yes. For instance, what about the senate race in Virginia? It was won by about 17,000 votes. That’s not a lot of votes. Sounds like a lot of votes. …took that advice to stay home, thereby allowing the other candidate to win. Isn’t that a great argument in favor of voting? Every vote really does count? Yeah, but the article implied that if a race looked already sewn up that voting doesn’t matter. Well this race looked decided according to the polls, but, as they say, there is only one poll that matters. And the result was very different when the votes were counted. You cannot say with any kind of certainty that the reason the loser lost (after being ahead in the polls) is that only those people who supported the eventual loser decided to stay home because of their candidate’s lead in the polls. It is entirely possible that the eventual winner (despite being behind in the polls in the run-up to the election) made a big advertisement push, or that the polls seemed to concern those people who supported the eventual winner and so motivated them to make sure they voted. There could be a number of reasons for the outcome. Okay, what if the race would have been won by exactly one vote? Then if I voted for the person down by one, there’d have to be a run-off (after what I’m sure would be very, very expensive additional vote counting, law suits, etc.). If, on the other hand, I had voted for the person up by one, that person would’ve won by two. So there’s just no reason to vote? I did not and have not said that. I am just trying to get us to look at what is going on with voting in all its complexity. So, for instance, I am also asking whether in the Maryland or the Virginia race or any other, whether there is a real difference between the candidates. If, to give another example, you voted for Obama because you didn’t like Bush’s war mongering, you had to be sorely disappointed. There turned out not to have been a dime’s bit of difference between them in the real world. You’re making me not want to vote. Well, that’s not my intention. I hope what I’m making you do is to think a lot more about voting than you probably do. You might still vote (even if I don’t). And in the future I might vote in some election in which you don’t. What I’m opposed to is mindlessness in voting (and non-voting, for that matter). I just heard a guy on the radio say that in his “political manifesto,” he’d make it mandatory that people vote. Okay, the argument that it be mandatory to vote (but not, evidently, mandatory that the voter be educated, that the candidates be clear on their positions, that the dissemination of views not be skewed by money, and so on), is that if everybody participated we might have a different looking country. The guy implies that he thinks it is solely a moral failing on the part of non-voters (the lazy bastards!). But is that accurate? Is there a real, legitimate, justifiable reason that people have for not voting? I think there is. I think a large part of the electorate has those reasons. I do not think it is the case that those who vote are more informed and more civic minded than those who don’t. The non-voters’ engagement with their communities might take a much different and, in the current conditions, much more effective form. I heard that two-thirds of the electorate did not vote on Tuesday. Yes. And my point is that that must be concerning to all of us, but we ought not to jump to the conclusion that non-voters are just lazy, that voters are more informed than non-voters, that voting must be made mandatory, etc. It is a sign of disease among the citizenry, but the patriotic scolds have almost certainly misdiagnosed it.